Spain’s Tribunal Supremo (Supreme Court) has ruled that non-consensual bodily contact of a sexual nature constitutes sexual abuse and not the lesser crime of coercion, leading the way for individuals found guilty of touching another’s body with sexual intent without the consent of the person being touched to face harsher penalties if convicted under the law. In a recent ruling revealed last week, the high court elevated to the level of sexual abuse any non-consensual body contact with sexual intent, increasing the possible sentence under Spain’s Criminal Code for those convicted to a prison sentence of 1 to 3 years or a fine payable over an 18-24 month period. Unsolicited bodily contact of a sexual nature previously was considered to be a crime of coercion, with the penalty for those convicted consisting only of fines, payable over a period of one to three months. In its ruling, the high court determined that any objective incident of bodily contact, touching or other physical act with sexual meaning, or any direct or indirect coercion of a victim to touch themselves in a manner imbued with sexual significance, is tantamount to the crime of sexual abuse and should be punishable as such. For the physical contact to be considered a crime, however, it must be accompanied by the subjective element of sexual intent on the part of the perpetrator. Women’s rights lawyers say that while the ruling is an advance, the subjective element of “intent” still leaves the commission of sexual abuse and punishment open to interpretation by individual judges. 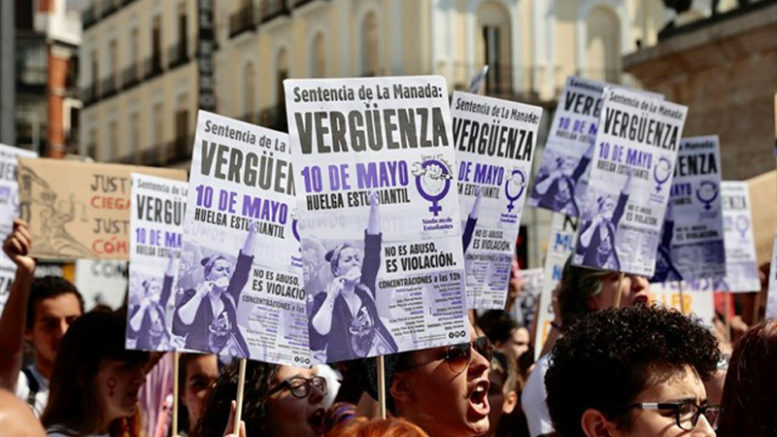 At the same time, they say the ruling does represent a paradigm shift in Spain, in that unwanted sexual contact such as groping or pinching in public places or on crowded public transport will no longer be considered just a slight infraction but carry the full stigma of sexual abuse and the penalties that go with it.